...crawl and slither through the corpse-choked mud. Shapes beyond imagining move in dirty white chlorine clouds. Dark waters stir as the long-dead claw their way toward a sun they haven't glimpsed in a thousand years. 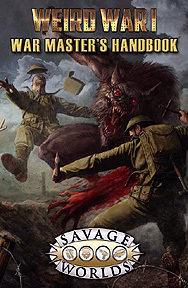 The Weird War I War Master's Guide contains the secret history of the Great War, two Plot Point Campaigns, Savage Tales, the Mission Generator, a narrative mission system, notorious heroes and villains, and a menagerie of twisted horrors to confront your brave heroes with. Requires the Weird War I Player's guide and Savage Worlds to play.